Gray wolves in the western Great Lakes and Northern Rockies will be removed from the federal endangered-species list by late February under a plan announced Wednesday by the Bush administration. Left out of the plan were wolves in Wyoming, where state officials sought a "predator zone" across most of the state within which the animals could be shot on sight. Federal officials said Wyoming law would have to change before wolves there could be taken off the endangered list. I'm surprised they are trying this again. Not disappointed, but surprised. First off, I don't know what good it will do. The wolf lovers will take it to court right away. It says it right in the article. Environmental and animal rights groups derided the move as a last-minute effort by the Bush administration to strip protections from an animal they say remains at risk. They promised Wednesday to return to court with another round of lawsuits. "These guys have been trying for eight years to explain how it could be possible for them to delist the wolves," said Jonathan Lovvorn, a vice president of the Humane Society of the United States. "It's time for them to throw in the towel." See, they come right out and said that they will spend whatever money is necessary to stop this. It doesn't matter how many wolves there are or how they affect the people living with them. They need to just "throw in the towel" and give up to their want's and desires. Second on this one will be to see what President Elect Obama does about this. Will he block the delisting like his core constituents want, or will he listen to the people like Ed Bangs, who know whats going on with the wolves. I'm not worried about it. As much as I would like to see the Wolves in the State go off the Endangered Species list so that they can be intelligently managed, it's not going to happen. Either the courts or President Elect Obama will stop it. Who will stop it first is the interesting question in this. The head of Montana's wolf program said earlier this week that the state would be willing to trap and transplant wolves to other states if requested. "We're open to it," said Caroline Sime of Montana Fish, Wildlife & Parks, in response to criticism from some environmental groups that believe the wolf population in Montana, Wyoming and Idaho is not large enough to sustain itself. Now this sounds like a plan, give wolves to other states. Hell, transplant them in wolf activist's back yards would work too. Make them live with them. We can't have the state's controlling the wildlife in their borders now can we? No, the Constitution and us would never allow such a thing. The tenth Amendment to the Constitution you say? Who cares, we've ignored it before. Let's sue to prevent prevent states from having any control over wolves. It will be fun. I sometimes wonder what these people think, if they think at all. In a recent letter to Interior Secretary Dirk Kempthorne, the congressmen wrote that states "hostile to wolf conservation" could reduce today's 1,500 wolves to "as few as 300" if the predators lose protected status. I would really like to see where Rep. Nick Rahall, Rep. George Miller, Rep. Norm Dicks, Rep. Wayne Gilchrest, and Rep. Jim Saxton got these numbers from. On further consideration, I don't want to see where these numbers come from because I think they pulled them out of their asses. It's real easy to speculate about these kinds of things when you live far away from the situation. It's a little more complicated when you live right with it. Have these sorry excuse for Congressmen paid any attention to the way the wolves are breeding them selves out of vittles in this area? Their growth has been explosive and it's still not coming down. Removing them from the endangered species list and manging them state by state only makes sense. The local trapper the other day told me that he seen wolf tracks in my area while setting his snares. Now I'm not sure there is a wolf around or not but it does weigh on my mind some that is for sure. It appears that a wolf killing 9 lambs near Big Timber merits an attempt to kill it, while a calf killed by wolves near Eureka (The original story headline was "Calf kills wolf near Eureka." I'm sure this has been corrected by now though thinking about it, it would be nice if calves did kill wolves, would solve a lot of problems in the area. ), doesn't. I find this interesting. I think one calf is as important as nine sheep but I am a little prejudiced that way, so shoot me. Hopefully both problems will be resolved with the judicious use of firepower. Well, the second herd of cattle near Emigrant tested all negative for Brucellosis. This allows me to breathe a small sigh of relief. Small I say. They are still testing cattle around the affected herds in Bridger so we could still see problems there so a big sigh of relief is not applicable. This still doesn't solve the problem of the Feds killing the affected herd for no reason but I can't do much about that. There is rumblings that the herd affected in Bridger is a purebred breeder that sells bulls and that anybody that bought bulls from him in the past 5 years is going to have their herd tested too. That could be a lot of cattle. That means a lot of chances for a second herd to come up positive and give us problems in Montana. Even though Montana has not lost its Brucellosis free status because of this situation, North Dakota has instituted a policy like we have lost our status and is going to require testing of cattle or bison being imported into their state from Montana. It won't surprise me if more of this comes down the line. Is it right that ND is doing this even though we haven't lost our brucellosis free status? No, but I can under stand why they are doing it. States are very scared of losing their brucellosis free status and are going to do everything they can to protect it. It's going to cost Montana cattle producers but we have no control over what other states do so we are stuck dealing with their rules. Governor Brian Schweitzer has made a list of ideas and recommendations for dealing with the reservoir of Brucellosis that is Yellowstone National Park. million head of cattle throughout the rest of the state. is an area the size of New York City on a map of the lower 48 states. effectiveness in cattle. Novel vaccines exist, including "RB51-plus,"
speed up disease research and development. I have to admit this are pretty good ideas but getting the Federal Government to buy into it will be very tough. They don't want a separate management area for Brucellosis. That would complicate their life. The park Service doesn't want to take responsibility for controlling the Brucellosis problem in the park so they don't want to look at a vaccination program or figuring out to use one. The items that the Governor has control over he is working on but these items under Federal control he is powerless to do anything about. It will be interesting to see where this goes. I have come across an interesting theory as to how the cows got Brucellosis in the first place. It's because of the wolves. It’s the wolves fault. Anyone can see that. The recent outbreak of brucellosis, which probably can’t be traced to bison or elk migrating out of Yellowstone National Park, is being caused by wolves eating infected afterbirth and then crapping near where cattle are grazing. Remember, the wolves were introduced by the feds. This is their way of getting cattle away from Yellowstone so they can create a huge buffalo commons. Am I supposed to feel bad that the wolves in Yellowstone Park have the mange? I'll guarantee you I don't feel bad about it. I only notice mange in coyotes whenever there is too many of them around so this must be a sure sign God/Mother Nature believes there are too many wolves in the area of Yellowstone Park and they need thinned out. As for the State of Montana introducing this disease over 100 years ago? I can't change that, I wasn't alive at the time. All I can do is deal with the consequences of what they did. The consequences is a disease that thins a population out when it gets to large. Let me repeat that, it doesn't kill them all, it just thins them out. I don't see what the problem is. Almost all animals have consequences if they breed themselves up to high. Disease is one way of thinning a species down. I always say that is why diseases are getting harder and harder for humans to control. God/Mother Nature keeps trying to find a disease to thin us, humans, out. We keep outwitting it. When God/Mother Nature finally finds the right disease, watch out, the death toll could be high. Do these statements by me mean I wish every wolf in the world to die? No. I think the populations need to be kept in check and managed. The Greater Yellowstone Park area has seen a very large decline in elk numbers since the introduction of wolves. Talk to any elk hunter that uses this area and they will confirm the stories. This indicates, to my small mind at least, that there are too many wolves in the area and something needs to be done about it. 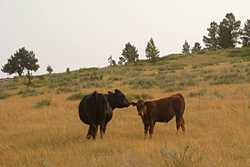 Reducing the population will also reduce the problems that ranchers have with these animals which is only a good thing. People get way to wrapped up in this wolf issue both in favor of it, and opposed to it. For those in favor of the wolves, believe me, they are no great, noble creature harvesting animals on need and having some mystical connection with the All Mighty like you think they do. For those opposed to them, they are no salivating, evil devil that only exists to eat animals and small children who only kill for the pleasure of killing. WOLVES ARE ANIMALS, JUST LIKE ANY OTHER. Their instincts lead them to be what they are, just another animal with needs and desires which are no different than any others. Food, family and survival. No mystical special animal or devil incarnate, just an animal trying to survive like all of us. I've pointed out before, ranchers oppose wolves on the grounds that they are a danger to their animals and lifestyle. Blaming ranchers for being upset with wolves is like blaming wolves for killing animals. They can't help but do what in their mind is the right thing to survive. We are natural antagonists, wolves and ranchers, that see the issue from different sides but both want the same thing, survival for who and what we are. Are we ranchers any more wrong than the wolf for this drive? I think not. Reintroducing wild wolves to the Scottish Highlands would help the local ecosystem, a study suggests. Wolves, which were hunted to extinction in Scotland in the late 1700s, would help control the numbers of red deer, the team from the UK and Norway said. This would aid the re-establishment of plants and birds - currently hampered by the deer population, they write in Proceedings of the Royal Society B. But farmers say more livestock would be killed if wolves are reintroduced. We aren't the only ones here in the western US that are worrying about wolves and their re-introduction. The forces are at work all over the world. Everybody looks at farmers and ranchers as obstructionists about wolf introduction. They don't seem to realize that to us it isn't an academic question. Wolves are not only a thereat to our livelihood, they are a threat to our animals who we care deeply for. Most of these animals we know, understand, and love. A lot of times we have raised them babies and it scares us that wolves might hurt them. We are not obstructing the wolves, we are flat scared of the consequences of them. Wolves in Montana and Idaho could be taken off the endangered species list even if Wyoming wolves remain listed, federal officials said Tuesday. A proposal to delist wolves could come as early as next month. Just a lot more talk, when will we see definite action? Montanans have been waiting for delisting for a couple of years and all we get is talk. I'm tired of hearing it. The mystery killer has been killed. Federal agents Thursday morning shot a 106-pound wolf believed to be responsible for sheep kills in Garfield, McCone and Dawson counties late last year and earlier this year. About 120 sheep died and others were injured in a spate of attacks that had local livestock owners on edge for months. There was frequent speculation among wildlife experts and locals that the elusive predator was either a wolf or wolf hybrid. Some thought there was more than one animal stalking the sheep. "We do think it was a single animal and this chapter is closed," Carolyn Sime, head of Montana Fish, Wildlife and Parks' wolf program, said Thursday evening. In a way, it is nothing new for a wolf to be shot for killing domestic livestock, so why do I point this particular one out? There are still plenty of questions about the wolf. Chief among them is where it came from. Wolves, especially males, are known for traveling far in search of food. The wolf shot Thursday was more than 150 miles from the fringes of the greater Yellowstone ecosystem, where the wolf population has grown to more than 300 since reintroduction in 1995 and 1996. There are no other known wolves in the area and it is so far from the site of re-introduction in Yellowstone park, that's why it's significant. People wonder why ranchers are concerned about wolves. "About 120 sheep died and others were injured in a spate of attacks." That's a significant loss for ranchers, they have a right to fear such things. I keep watching and waiting. There will be wolves in this area with time. I am not looking forward to it or the consequences it will bring to me. Remember, wolves do not attack human beings. A lone black wolf that attacked six people, including several young children, in a provincial park over the long weekend has tested negative for rabies, the Algoma Health Unit said Wednesday. The remains of the wolf, which has been blamed for several separate attacks Monday at the popular Katherine's Cove beach on Lake Superior, was tested for rabies and other diseases after it was shot by park staff. I guess this wolf never read all the press saying that wolves don't attack humans. According to all the people who fawn over them they are gentle creatures that would never hurt a soul. Maybe they need the teach the wolves to read so none will screw up and attack humans in the future. If this doesn't scare parents with little children it ought to. Then it clamped its jaws around three-year-old Leah Talbot's left upper arm and began dragging her away from her grandmother and sister.